by Chris Woodford. Last updated: August 9, 2018. Twenty or thirty years ago, many people thought computers would make paper obsolete. The Xerox company, which pioneered photocopiers in the 1960s, became so worried that paper was going to disappear (and wipe out its lucrative business) that it set up a famous laboratory called PARC to develop computers instead. Ironically, even though Xerox PARC helped to invent the computers we all rely on today, paper stayed as popular as ever: people loved it and it was just good too an invention to replace. Now, thanks to the popularity of home computers and digital cameras, more people have printing machines in their homes than ever before—and most of them are inkjet printers. But how exactly do they work? Photo: A portable Canon inkjet printer from the late 1990s. 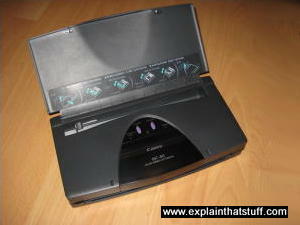 This one also works as a scanner if you replace the print head with a scanner cartridge. To understand inkjet printers, it helps if you understand how computer printers worked before inkjet technology came along. That means understanding metal type and the computer printers that evolved from it. Photo: The metal type in a relatively modern typewriter. The letters are backward so they print the right way round when they press an inked ribbon against the paper. Let's rewind a few hundred years, back to the 15th century. There was some small-scale printing with wooden blocks before this time, but printing only really took off when a German printer named Johannes Gutenberg (c.1400–1468) invented something called movable metal type around 1450. If you've ever seen a typewriter (a personal letter-writing machine popular until computers came along in the 1980s), you'll know all about metal type. A typewriter has a keyboard like the one on a computer, but instead of making letters appear one at a time on the screen, it prints them directly onto a piece of paper. 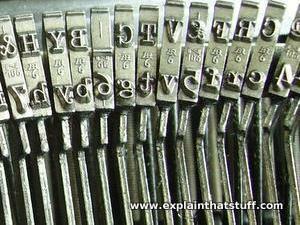 Inside the typewriter, there are metal letters called pieces of type. As you press the keys, the pieces of type hammer against a ribbon (a spool of fabric) covered in ink and make an impression on the paper. Gutenberg was the pioneer of metal type. He made thousands of little metal letters (printed in relief and in reverse) and moved them around inside wooden blocks so he could print any page he liked—hence the name "movable metal type". Typewriters were based on Gutenberg's invention and took off in the 1860s after American journalist Christopher Latham Sholes (1819–1890) and his partners made the first really practical typing machine (dozens of other people had tried before). Although typewriters were a brilliant invention, they could make only one copy of a piece of information at a time. Because they printed directly onto the paper, typing could be slow and messy and mistakes were difficult to correct. When business computers started to become popular in the 1960s, many people became interested in using them as word processors: highly automated typewriters that allowed text to be typed onto a screen, edited and corrected until it was perfect, and only then printed out onto paper. Early computer printers borrowed heavily from typewriter technology, but it soon became obvious that better methods were needed for quicker and more efficient printing. Instead of using rows of metal levers to hammer letters against the page, as in a typewriter, computer printers (and electric typewriters, which were similar) started to use three other technologies. One of them was called a golf ball. The golf ball typewriter or printer has all the letters, numbers, and other characters it needs to print arranged on the surface of a metal ball. To print a word, the ball rotates at high speed until the right piece of type is facing the paper. Then it flips up and bashes the type against a ribbon, pressing the letter onto the page. Having done that, it spins round to the next letter... and so on. The second printing technology was called a daisy wheel, in which the type letters are arranged like petals around a central wheel. A bit like a golf ball, the daisy wheel rotates at high speed, stopping to press letters against the ribbon when they are in the correct position. A third printing technology, known as dot-matrix, was popular from the 1970s until about the early 1990s. In a dot-matrix printer, there is no metal type at all. Instead, letters are printed by a matrix (a square or rectangular grid) of several dozen metal needles that press against a ribbon in different patterns to make whichever letter, number, or other character is required. 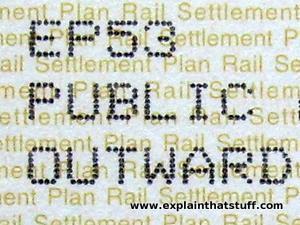 Dot-matrix printers produce a characteristic "dotty" print finish that you still sometimes see on bills, invoices, and railroad train or movie-theater tickets. They were fast and relatively inexpensive (to buy and to run), but extremely noisy. Picture: Using a pattern of dots to create letter shapes is the basic idea of dot-matrix printing. Old-style dot-matrix printers typically did this with a five by seven or seven by seven square (matrix) of metal needles. With smaller needles and more of them, you can make better-looking characters—but the printout still tends to look a bit dotty on close inspection. Inkjet printers were really an evolution of dot-matrix printers. Instead of metal needles, they use hundreds of tiny guns to fire dots of ink at the paper instead. The characters they print are still made up of dots, just like in a dot-matrix printer, but the dots are so very tiny that you cannot see them. Different types of inkjet printer fire the ink in various ways. In Canon printers, the ink is fired by heating it so it explodes toward the paper in bubbles. This is why Canon sells its printers under the brand name "Bubble Jet." Epson printers work a slightly different way. They use an effect called piezoelectricity. Tiny electric currents controlled by electronic circuits inside the printer make miniature crystals jiggle back and forth, firing ink in jets as they do so. You can think of inkjet printers very simply as a firing squad of nozzles rattling off millions of dots of ink at the paper every single second! Under instructions from your computer, an electronic circuit in the printer figures out which nozzles have to be fired to print a particular character at a certain point on the page. Hundreds of nozzles are involved in making a single character and each one is only about a tenth as thick as a human hair! The circuit activates each of the nozzles by passing an electric current through a small resistor inside it. When electricity flows through the resistor, it heats up. Heat from the resistor boils the ink inside the nozzle immediately next to it. As the ink boils, it forms into a bubble of ink vapor. The bubble expands enormously and bursts. When the bubble pops, it squirts the ink it contained onto the page in a precisely formed dot. The collapsing bubble creates a partial vacuum in the nozzle that draws in more ink from the ink tank, ready for printing the next dot. Meanwhile the entire print head (light orange) is moving to the side ready to print the next character. An ink tank (black) supplies the ink dispenser (green) through a narrow tube by capillary action. A droplet of ink from the tank sits waiting at the very end of the tube. When the printer circuit (not shown) wants to fire an ink droplet, it energizes two electrical contacts (red) attached to the piezoelectric crystal. The energized piezoelectric crystal (dark red) flexes outward (toward the right in this picture). It squashes against a membrane (dark blue), pushing that toward the right as well. The membrane pushes against a hole in the ink dispenser (green), increasing the pressure there. The pressure forces the waiting ink droplet from the tube toward the paper. Photo: Here's the print head (sometimes called a print cartridge) removed from my inkjet and turned upside down, showing the slits where the inkjet nozzles are located. The single long slit on the right is where black ink comes out. 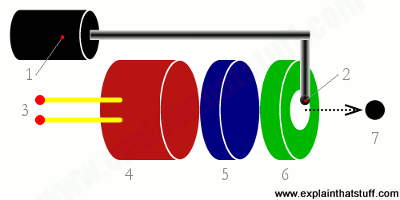 The three smaller slits on the left are for the three colored inks that make color prints. 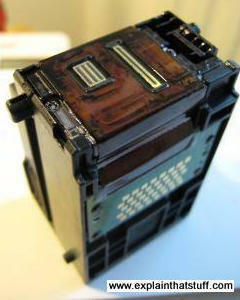 Note the pattern of copper connectors on the front that connect the cartridge to the printer's electronics. Like dot-matrix printers, inkjets make their print with a pattern of dots. The difference is that where a dot-matrix uses maybe 64 metal needles to make 64 dots per character, inkjets fire thousands of dots to make much higher print quality. Even an average inkjet can print 600 dots per inch (dpi), which is about ten times better than the crudest dot-matrix. A really good photo-quality inkjet can print at nearly 5000 dpi. Where a dot-matrix printer makes a horrible screaming sound as its print needles tear across the page, the only noise an inkjet makes comes from the sheets of paper feeding in and out and advancing through the mechanism. The inkjet nozzles build up a whole page of text or graphics from millions of separate dots. Controlled by your computer, the ink cartridge scans from left to right across the page and back again, depositing ink as it goes. Each time it reaches the end of a line, the paper advances forward slightly so the next line can be printed. 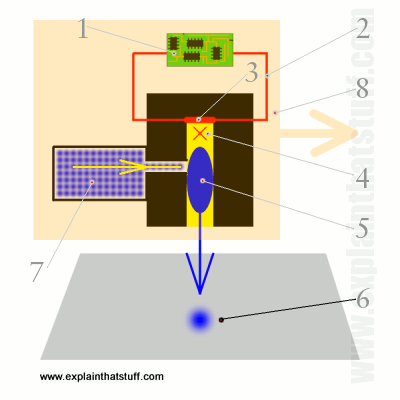 What are the main parts of an inkjet printer? Plastic gears driven by an electric stepper motor turn rollers that advance the paper through the printer. Plastic and rubber rollers pinch the paper tightly so it can be moved through the printer with absolute precision. A sturdy metal rail guides the printer head as it moves back and forth. Spiked wheels at the front of the printer help to grip the paper securely and move it precisely. The print cartridge prints from left to right then reverses the print information and prints backwards from right to left. This is known as bidirectional printing and allows pages to be printed much faster. Inkjet printers are extremely cheap to buy; even all-in-one printers, with scanning and basic "photocopying" (which involves scanning and then printing) built into the same machine are remarkably inexpensive. Before you marvel at what a great deal you're getting, take a moment to ponder how printer makers can afford to do this: they earn their money not from the printers but from the inkjet cartridges you'll keep feeding into them forever more (the so-called razor-and-blades business model). Considering that inkjet cartridges are little more than tiny plastic boxes with ink-filled sponges inside, they're very expensive. The printers themselves seem designed to use as much ink as they possibly can with endless nozzle-cleaning maintenance routines (each one of which uses a bit more ink). What can you do to make your ink (and money) go further? When you're shopping for a printer, be sure to check detailed consumer reviews. Look out for a model with a refillable ink tank or other ink-saving features; make sure it will accept cheap compatible cartridges to save you buying the manufacturer's expensive originals and (if you don't mind getting your hands dirty from time to time) see if you'll be able to refill the cartridges yourself using an ink bottle and syringe (YouTube will show you how). Print in draft mode whenever you can (it's faster and uses less ink) and try experimenting with ink-saving fonts. A number of independent testers have concluded that Century Gothic, Calibri, and Times New Roman save a considerable amount of ink compared to Arial, most people's default Microsoft font. You can find more tips for saving money on ink at Consumer Reports. Artwork: Switching from Arial to Times New Roman uses about a quarter less ink, according to Consumer Reports. But don't get too carried away: saving money on ink won't save money in your company if it takes people longer to read things. Inkjet! : History, Technology, Markets, and Applications by Frank J. Romano. Ingram, 2012. A comprehensive survey of inkjets, covering everything from how they work and who invented them to who buys them and their applications beyond simple office printing. Inkjet Applications by Matt Gilliland and Frank Cloutier. Woodglen Press, 2005. A hobbyist's guide to employing inkjets in robots and other electronic projects. The Chemistry of Inkjet Inks by Shlomo Magdassi. World Scientific, 2010. Explains how inkjet inks are chemically engineered to improve their permanence, color performance, fluidity (as they shoot through the inkjet nozzles), and surface adhesion to paper and other printing surfaces..
How can I recycle my inkjet printer? by Rebecca Smithers. The Guardian, April 29, 2018. Despite a few promising tips in this article, there's no easy answer. When the Sous-Chef Is an Inkjet by David Bernstein. The New York Times, February 3, 2005. How a creative chef prints edible ink with his printer. Computer Activator by Drew Kaplan. Popular Science, July 1984. A little bit of history! This article describes one of the earliest inkjet printers from Olivetti. Epic take-apart: HP Color LaserJet 2600n: Evil mad Scientist Laboratories, June 2008. 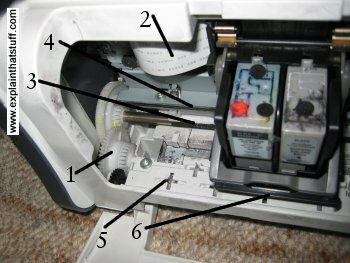 Although this article is about dismantling a laserjet, some of the mechanism (the paper feed, for example) is quite similar to what's in an inkjet. US Patent 2,566,443: Measuring instrument of the recording type by Rune Elmqvist, published September 4, 1951. An early inkjet designed to record traces from oscilloscopes onto paper. US Patent 4,045,801: Ink ejection head for printer by Kyuhachiro Iwasaki, Ricoh Company, Ltd., published August 30, 1977. An inkjet that squirts ink using an electrostrictive method (similar to the piezoelectric method). US Patent 4,131,899: Droplet generator for an ink jet printer by Kyriakos Christou, Burroughs, published December 26, 1978. Another piezoelectric printer. US Patent 4,251,824: Liquid jet recording method with variable thermal viscosity modulation by Toshitami Hara et al, Canon, published February 17, 1981. The original thermal bubble jet printer. US Patent 4,532,530: Bubble jet printing device by William D. Hawkins, Xerox, published July 30, 1985. An alternative bubble jet design. Instructables: Conductive Fabric: Make Flexible Circuits Using An Inkjet Printer by mikey77. Using an inket printer to lay a flexible circuit design onto a piece of fabric. Instructables: Converting an Inkjet Printer to Print PCBs by pourcirm. Another good example of using inkjets to print things other than paper. Here, a modified printer is used to print a circuit design on a copper-clad board.